An all-purpose, pro-grade pre-mixed bridging and patching compound that dries flexible to prevent cracks from reappearing. It can be used to repair cracks in wood, stucco, plaster, concrete and tile. 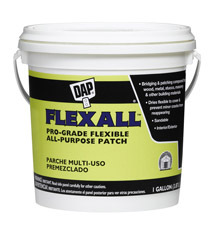 FLEXALL™ may also be used to cover minor cracks in stucco surfaces and wood fascia board. Sandable. Interior/exterior use.